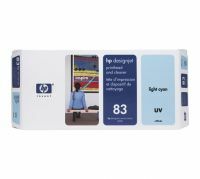 HP 83 UV Printheads produce superb, fade-resistant images on a variety of media. Long-life printheads work with the printer for fast, reliable, cost-effective operation. Smart printing technology3 monitors printhead performance to optimize results. C4962A HP 83 UV Printheads produce superb, fade-resistant images on a variety of media. Long-life printheads work with the printer for fast, reliable, cost-effective operation. Smart printing technology3 monitors printhead performance to optimize results. Six UV-resistant ink colors and HP's Jetexpress technology combine to help bring durability, unrivalled print speeds, and ultimate photo quality to production printing. Designed for HP Designjet 5500 UV, 5500ps UV, 5000 UV and 5000ps UV printers. 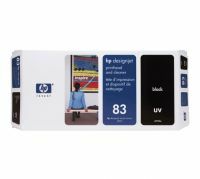 Advanced large-format printhead technology, ink cartridge technology and proprietary UV ink formulations ensure consistent print quality. HP-engineered to work as a modular ink system with HP 83 UV Ink Cartridges. Extra-wide HP 83 UV Printhead features HP Jetexpress technology for unrivaled print speeds. To Recieve updates and possible rewards for Hewlett Packard (HP) HP 83 Magenta UV Printhead and Printhead Cleaner please sign in. To Recieve updates and possible rewards for Printer Cartridge, Ink & Toner please sign in.